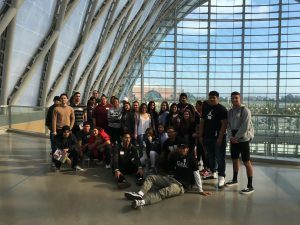 La Voz Marketing recently supported the Rancho Santiago Community College District (RSCCD) in planning and executing its first ‘Hop On, Hop Off Tour’ to raise awareness of job opportunities among high school students. The program focused on opportunities in the retail, hospitality, and tourism fields. LVM partnered with the Anaheim Regional Transportation Intermodal Center (ARTIC), the Honda Center / Anaheim Ducks, Visit Anaheim, Bubba Gump Shrimp Co., Hilton Anaheim and Angels Baseball to give students from various community colleges in the area an introduction to the world of hospitality, tourism and more. 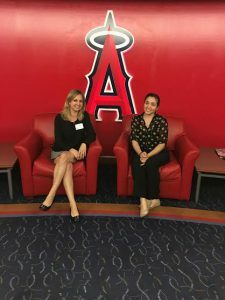 The tour, which included experiences at ARTIC, the Honda Center, the Anaheim Convention Center, and Angel Stadium of Anaheim, was the first of its kind to be hosted by the RSCCD. It featured a lunch panel of speakers from Visit Anaheim, Hilton of Anaheim and Bubba Gump Shrimp Co., which allowed students to get an inside look into at jobs in these areas and a chance to ask the questions from the experts. If you also believe in the cause of helping students become passionate to achieve their goals through education, or if you yourself are still searching for your passion, contact RSCCD today to find a program at your local community college!